As promised, I am showing some new stuff I’m working on for the dating game. I was hoping to be finished by now but I keep getting distracted by other matters. All I can say is it will be done when it is done. The sequel is likely going to be in Visual Novel format, which means I can do things like have an actual plot, but it also means part of the process requires me to write a regular novel first, and since November is National Write a Novel Month, I’d like to participate and push myself to write the thing, instead of just the advanced outline I currently have. Meanwhile, I’m still not done with the set building and rendering on the current project. Got a dozen or so more pics to do spread over two sets I have yet to build. I may release what I have so far as a “beta” release, haven’t decided yet. Above is a new museum set, the old one was a screenshot from a video game, and looked lame. This one looks very pretty, especially with the reflections on the marble floor. Here’s the interior of the night club. There are musical instruments on the stage for a band that will appear in the sequel, but for the current club scene, I just created a DJ. The DJ Booth by the way is nothing but a black box. When creating the original pictures, sometimes I saved the 3D files, and sometimes I saved the TIF file renders. In the above picture, I used the original TIF file, and inserted a new background. 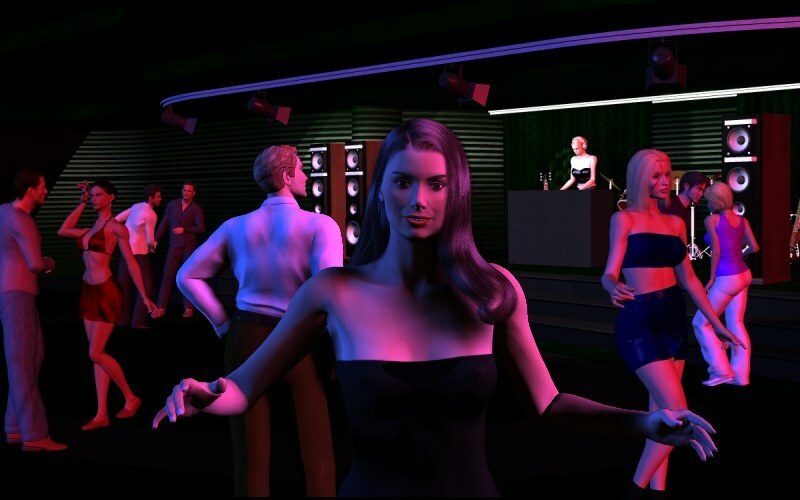 This picture, from the new bar set, takes the original 3D file, with poses and props, and moves it into a new 3D set. In the original bar scene, I just used a single flat game screenshot for every single bar scene image. Now with a 3D set, I can give all the pictures new angles and play with the lighting some more. Then there are pictures like the museum pic at the top, which is both an all new pose, and an all new set. when u gonna release the new version? Just don’t go changin’ Ariane; she’s fine the way she is. when is going to be released? Soon, life has been extra busy this month, but I should have time next weekend to finish. Nice job, im so waiting for it.